The Grace and Truth Sport Park has some of the best kept soccer fields and baseball diamonds in Monroe County. 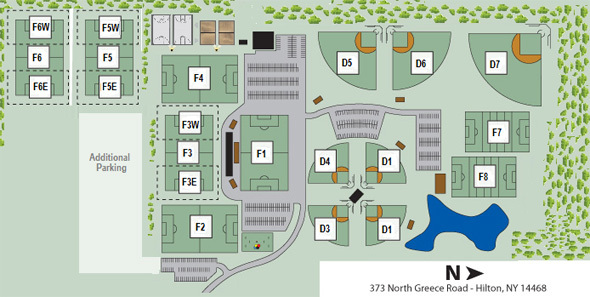 It is home to six full sized soccer fields (F1 - F6), four junior size soccer fields (F3W, F3E, F5E, F5W, F6E, and F6W), four minor size soccer fields (F7 and F8), four youth league baseball diamonds (D1 - D4), a full sized high school baseball diamond (D7), a 'skinned' softball diamond (D6) and a versatile diamond that can be used for baseball or softball (D5). Below are the specifications of each baseball diamond and soccer field. *When the F3 field is used, both F3W and F3E are unavailable. When F5 or F6 are used, F5E, F5W, F6E, and F6W are all unavailable. * When F3W and/or F3E are used, the F3 (South) Field is unavailable. When either F5E, F5W, F6E, or F6W are used, both F5 and F6 are unavailable.